Christine Nixon, Children of Phoenix Ambassador 2008-2010. Children of Phoenix are honoured and pleased to announce that Chief Commissioner of Victoria Police Christine Nixon APM, will be the Inaugural Ambassador for the organisation. Ms Nixon is an advocate of sexual assault victims, with survivors holding her in high esteem. Christine has played key roles in the establishment of various key statewide committees that bring together key stakeholders and services to collaborate for effective responses to eliminate violence against women and children. 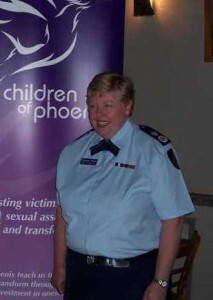 Under Christine’s leadership, Victoria Police have taken a social leadership role with regard to sexual violence and family violence affecting the lives of children and adults and addressing the needs of disaffected and disengaged youth in our society.In 2001 when she was sworn in as Chief Commissioner she was the first woman to lead a police force in Australia .